Look into a mirror and you'll simultaneously see the familiar and the alien: an image of you, but with left and right reversed. 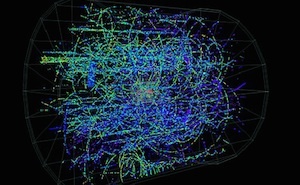 As the high-energy physics community gears up for the flood of new data from the Large Hadron Collider (LHC), now may be a good time to ponder the existence of a theory of everything or, more bombastically, a final theory. Fifty-five years after Einstein's death, the hunt for an elusive unified field theory continues. The time has come to shift our focus. During the past few decades, a new way of thinking about the natural world has emerged that emphasizes change and transformation rather than stasis and perfection. Can our knowledge of Nature ever be complete?